Transparency Market Research has published a new report on the global mobile wallet market. As per the report, the global mobile wallet market is expected to expand at an alarming 30.70% CAGR during the period between 2012 and 2018. 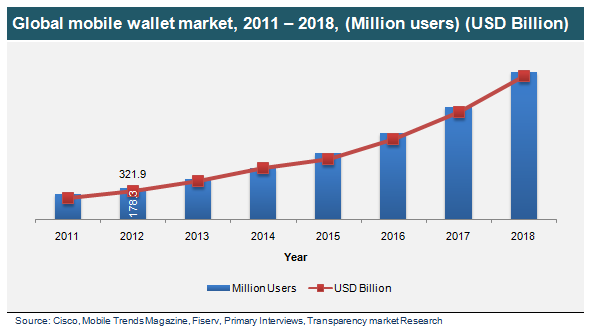 The report, titled ‘Mobile Wallet Market - Global Industry Analysis, Size, Share, Growth and Forecast 2012 - 2018’, states that the global mobile wallet market is expected to reach US$1,602.4 bn by 2018 due to growing penetration of the smartphone market. Mobile wallet is a technology used for storing an individual’s financial information on NFC-enabled mobile phones. The mobile wallet technology facilitates payment for various items and services without the use of cash. Mobile wallet services and solutions are commonly implemented by regulatory authorities under financial supervision. There has been an increasing use of mobile wallet technologies in supermarkets and general stores over the past few years. Increased use of smartphones, increased usage of mobile data, and information security are some of the primary reasons behind the rapid growth of the global mobile wallet market. Increased use of mobile devices for making payments is expected to drive the global mobile wallet market further. Enhanced customer experience, well-conceived user engagement, security, and speed are some other elements of mobile wallet boosting the global market. Due to all these factors, there has been an increase in the number of people switching from cash or credit to mobile wallet services. Further, increased production of smartphones that are enabled with near field communication and point-of-sale terminals will boost the growth prospects of the global mobile wallet market during the forecast period. The major stakeholders in the global mobile wallet market are banks, financial institutions, value added services, card operators, device manufacturers, mobile network operators, operating system providers, users, and legal authorities. The global mobile wallet market is segmented on the basis of geography, industry participants, consumer type, application, and component. Retail, vending machines, public, grocery stores, and restaurants are the application segments of the global mobile wallet market. In 2011, the global mobile wallet market was dominated by the retail segment, which was valued at US$144.8 bn. Based on geography, the global mobile wallet market is divided into North America, EMEA, Latin America, and Asia Pacific. North America was the most developed region in the global mobile wallet market in the recent past. Other regions are expected to register steady growth in the coming few years. Increasing usage of mobile data has resulted in the expansion of the mobile wallet market. Merchants or retailers in the global mobile wallet market provide a lot of benefits to the users, which can be easily availed using an active data connection. In emerging economies, the penetration of mobile phones is higher as compared to traditional banking. Some of the leading companies across various regions are PayPal, V.me, LevelUp, Amazon Payments, ISIS, Google Wallet, and others. The leading companies are expected to face a high level of competition from emerging companies in the coming years.